Soft Backrest Cushion for additional stability and comfort, small users and young adults. Soft Backrest Cushion for additional stability and comfort, small users and young adults. Can also be used if seat area is too big. Does not attach but simply sits behind user and pads back and sides. Blue removable mesh cover over a vinyl covered foam cushion. 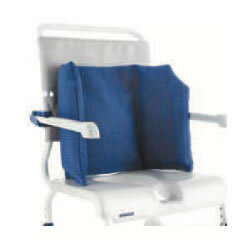 Designed to fit shower commode chairs: Ocean, Ocean XL, Ocean VIP, Ocean Dual VIP, Ocean E-VIP.